Abstract: Molecular technology allows researchers to definitively identify red imported fire ants as either monogyne or polygyne based on the alleles present at the single gene Gp-9. This technique has not previously been applied to hybrid individuals of the red and black imported fire ants. Specimens were collected from 81 imported fire ant colonies from 27 locations over a four county area within the imported fire ant hybrid zone in east-central Mississippi. 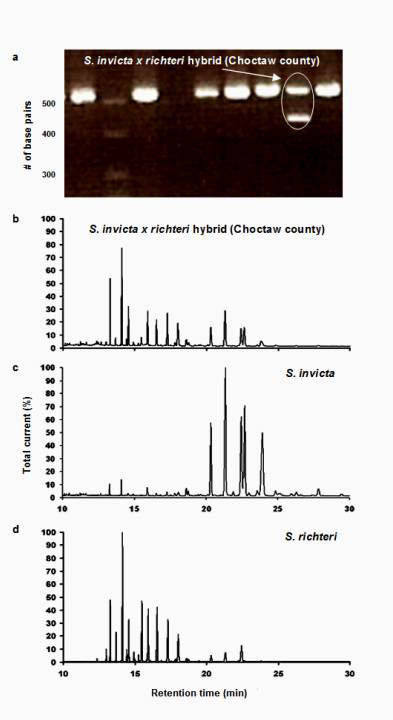 Gas chromatograph analysis of cuticular hydrocarbons and venom alkaloids was used to determine the species or species hybrid status of all colonies. Polymerase chain reaction (PCR) was used to determine the alleles present at the Gp-9 locus. All colonies were determined to be hybrid imported fire ants, and 14 colonies from seven locations possessed the Gp-9b allele, which is associated with polygyny. These 14 colonies are the first such colonies of hybrid imported fire ants shown to possess the alleles at Gp-9 associated with polygyny. Imported fire ants are a complex of non-native ant species of the genus Solenopsis (Buren 1972) that first appeared in North America in the early 20th century in the vicinity of Mobile, Alabama, and have since spread across the southeastern United States (Wilson 1959). This complex was initially identified as a single species, Solenopsis saevissima richteri Forel (Wilson 1951), but has since been determined to be two species with separate introductions; S. invicta Buren, the red imported fire ant, and S. richteri Buren, the black imported fire ant. A hybrid zone now exists where the ranges of these two species overlap. The two imported fire ant species and their hybrids can be distinguished by using gas chromatograph analysis of cuticular hydrocarbons and venom alkaloids (Vander Meer et al. 1985; Ross et al.1987). Two social forms of imported fire ants have been identified. The monogyne, or single queen form, is the most common, but they can also occur as a polygyne, or multiple queen form. The polygyne form of the red imported fire ant has been studied extensively. A polygyne form has also been reported for the hybrid between the red and black imported fire ant (Glancey et al. 1989) and for the black imported fire ant within its native range (Krieger and Ross 2002), but has not been found in North American populations of S. richteri. The polygyne form of S. invicta typically spreads by budding of new colonies from older ones (Vargo and Porter 1989), tends to be less aggressive towards con-specifics than the monogyne form (Morel et al. 1990), and often establishes large super colonies. Areas with the polygyne form also tend to have higher imported fire ant densities than monogyne areas (Macom and Porter 1996). Recent technology has enabled researchers to positively identify red imported fire ants as polygyne based on the presence of the Gp-9b allele at the Gp-9 locus (Valles and Porter 2003). This technique is not suitable for identifying S. richteri as polygyne, because a different allele is associated with polygyny in that species, and has not been applied to the hybrid imported fire ant, which could potentially possess alleles from either parental species. The zone of hybridization between the red and black imported fire ants stretches across parts of central to northern Mississippi (Streett et al. 2006), Alabama, and southern Tennessee. One of the earliest descriptions of polygyny in imported fire ants came from within the hybrid zone (Glancey et al. 1973) in Mississippi. This occurred at a time when imported fire ants were still being treated as a single species. Polygyny was later reported within hybrids from the same area (Glancey et al. 1989), but their identification was based on behavioral and morphological characters. The goal of this project was to determine where the various imported fire ant species and social forms occur in four counties within the hybrid zone in east-central Mississippi and to confirm the presence of polygyny in hybrid imported fire ants by using molecular methods. The species/hybrid status and social form of colonies within this area are of particular importance because the area includes a large section of the Tombigbee National Forest and the campus of Mississippi State University, where there is currently an active imported fire ant research program. Imported fire ants were collected from colonies over a four county area within the hybrid zone in east-central Mississippi. A grid of 27 points, spaced 10.0 km apart, was overlaid on a map of Choctaw, Noxubee, Oktibbeha and Winston counties. These counties cover parts of three physiographic regions. From east to west they are the Black-belt Prairie, the Flatwoods and the North-central Plateau. Although these regions differ in soils, vegetation, topography and land use, they are at the same latitude and should be similar in terms of climate. The 27 points were located using a global positioning system (GPS) and imported fire ants were collected from roadside populations at the closest accessible location to each point. This resulted in five locations in the Black-belt Prairie, five in the Flatwoods region, 13 in the North Central Plateau, and three that were marginal between regions. Ants were collected from 3 colonies at each site, making a total of 81 collections. To make a collection, a shovel was used to remove the top of the mound and soil and ants were then placed in a white 19 liter (5 gallon) PVC bucket. The bucket was held at a 45° angle and individual ants were collected with an aspirator as they attempted to climb out of the bucket. From each colony, 100 workers were collected in 5 ml of hexane for gas chromatograph analysis of venom alkaloids and cuticular hydrocarbons and at least five workers were collected in 15 ml of 100% ethanol for DNA isolation and polymerase chain reaction (PCR) analysis. The two ant species and their hybrid can be separated by using profiles of worker venom alkaloids and cuticular hydrocarbons (Vander Meer et al. 1985; Ross et al.1987). Worker ants were allowed to soak in hexane for a period of at least two days. The samples were taken to the USDA Agricultural Research Service in Stoneville, Mississippi, where they were analyzed by using gas chromatography and a mass spectrometer (GC-MS). A Varian GC-MS system was used for this study and consisted of a CP-3800 gas chromatograph with a DB-1 capillary column (30 m × 0.25 mm i.d., 0.25 µm film thickness) and a Saturn 2000 mass selective detector. The GC temperature was programmed as follows: initial temperature was 50°C, held for 1 min, increased to 240°C at a rate of 20°C /min, and held for 29.5 min. The split ratio was 1:10, injection temperature was 250°C, and transfer line temperature was 270°C. The mass spectrometer was operated at 70 eV in the electron impact mode. The separation of species and the hybrid followed the method described by Ross et al. (1987). Control S. invicta and S. richteri samples were taken from stocks already available at the facility. In this GC condition, retention time for five typical alkaloid peaks (C11:0, C13:1, C13:0, C15:1, and C15:0) (Ross et al.1987) were 10.33, 11.33, 11.50, 12.87, and 13.13 min respectively. These alkaloid peaks were used to calculate the alkaloid index (IALK) which was defined as IALK = (P15:1(2.36), where P15:1 is the proportion of C15:1 alkaloid. Hydrocarbon peaks found between 15.00 to 24.20 min were used to calculate the cuticular hydrocarbon index (IHC) which was defined as IHC = (PSI – (PSR*0.116))/(( PSI – (PSR*0.116) + (PSR – (PSI*0.072)), where PSI and PSR are the proportional hydrocarbon peak area found within the retention times assigned to S. invicta and S. richteri, respectively. In this GC condition, the designated hydrocarbon region was 15:00 to 20.00 min for S. richteri and 20:00 to 24.20 min for S. invicta. The combined index is the mean of IHC and IALK. A colony was considered to be hybrid if the combined index was greater than 0.06 and less than 0.85 (Ross et al.1987). The IALK, IHC and combined indexes were used because they are not sensitive to the variation among GC systems as long as PSI and PSR are based on results from the same system. Polymerase chain reaction was used to determine the presence/absence of the Gp-9b allele. Keller and Ross (1999) showed that two major alleles are present at Gp-9 in S. invicta in the United States, the Gp-9B and Gp-9b. Other variations have since been found in S. invicta from its native range (Krieger and Ross 2002, Gotzek et al 2007) but not in the United States. All monogyne queens possess only the Gp-9B allele (individuals being Gp-9BB), whereas polygyne queens also possess the Gp-9b allele and female offspring are either Gp-9BB, Gp-9Bb or Gp-9bb. The Gp-9bb genotype occurs much less frequently, either because this genotype is a lethal recessive (Keller and Ross 1999) or because its phenotype causes workers of a differing genotype to destroy Gp-9bb brood (Fritz et al. 2006). Valles and Porter (2003) have designed two oligonucleotide primer pairs that target the Gp-9B and the Gp-9b alleles in a multiplex reaction. Using these primers on an individual with a homozygous (monogyne) genotype produces a 517 base pair amplicon that is derived from the Gp-9B allele. Using the primers on a heterozygous (polygyne) genotype produces both the 517 base pair amplicon and a 423 base pair amplicon that is derived from the Gp-9b allele. The methods used by Valles and Porter (2003) were used on the pooled DNA from five ants from each colony. A polygyne queen that has mated to a monogyne male, an event that may occur frequently in some areas (Ross 1997), will produce workers exhibiting both the Gp-9Bb and the Gp-9BB genotype. Using the DNA of five ants from each colony reduced the chances of misidentifying a polygyne Gp-9b positive colony as monogyne to 3.125%, which we considered an acceptable risk of error. There is the possibility that a hybrid colony could be polygyne but not possess the Gp-9b allele, if that colony’s polygyny was inherited from S. richteri. Because the allele associated with polygyny in that species is different from the Gp-9b (Krieger and Ross 2002), it would not be detected by using these methods. The S. richteri polygyne allele has not been detected in North America, but if present could greatly increase the incidence of polygyny in hybrids beyond what has been detected here (this is addressed in greater detail in the discussion). Total DNA was isolated by using a Qiagen DNeasy kit (Qiagen, Valencia CA). The head and thorax tissue from five workers was combined for evaluating each mound's Gp-9 genotype. For queens, individual head and thorax tissue was used. Samples were placed in 1.5 ml microcentrifuge tubes, frozen in liquid nitrogen and ground by using a sterile pestle. From this point, the protocol for animal tissues in the Qiagen kit was followed. The conditions used for the multiplex PCR were as described by Valles and Porter (2003), except that we substituted 1 unit of TaKaRa Taq, hot start version, for the DNA polymerase for each reaction. Amplified DNA (10 µl) was electrophoresed on a 4.0% agarose gel for 1 hr and 50 min at 200V, stained with ethidium bromide and photographed in UV light. Ants used as controls were collected from colonies confirmed to be polygyne S. invicta, monogyne S. invicta and monogyne hybrids. The polygyne S. invicta ants were taken from a colony that was collected in a polygyne area of Brazos County, Texas. Monogyne S. invicta were collected at a site in southeast Louisiana that is well outside of the hybrid zone. Monogyne hybrids were collected outside of the Clay Lyle Entomology building on the campus of Mississippi State University in Starkville, Mississippi, which is within the hybrid zone. The monogyne S. invicta and monogyne hybrids were informally tested for aggressiveness towards con-specifics from other colonies to confirm their monogyne status. The species/hybrid status of control colonies were confirmed by using GC-MS.
All 81 colonies from the 27 sample locations were identified as hybrids, based on the results of the GC-MS analysis described above. Fourteen colonies from seven of the 27 locations and the one polygyne S. invicta control colony had both the 517 and 423 base pair amplicons, indicating that some individuals possessed the Gp-9b allele. 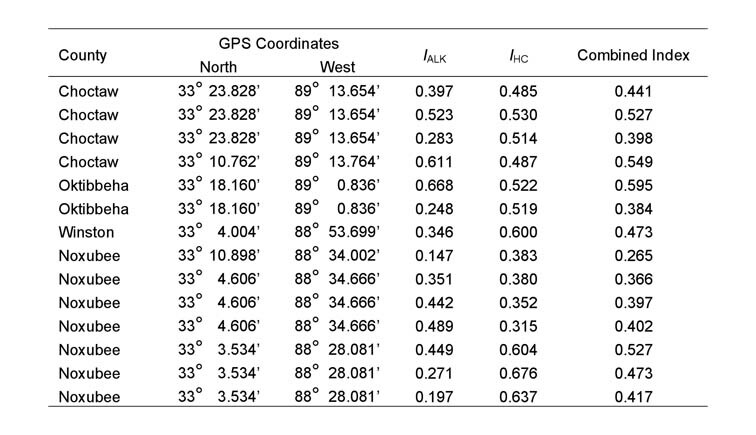 The IHCs, IARKs and combined indices of all hybrid colonies that were found to possess the Gp-9b allele are listed in Table 1, along with the lat-long coordinates and the county of their occurrence. A chromatogram of purified cuticular hydrocarbons from a hybrid colony and its PCR results are shown in Figure 1.The remaining 67 colonies and the monogyne control colonies produced only the 517 base pair amplicon and were considered negative for the Gp-9b allele. Four locations that produced ants with the Gp-9b allele were within the North-central Plateau region, three were within the Black-belt Prairie region and none were within the Flatwoods region (Figure 2). A full year passed between the initial collections and the completion of analysis, making it impossible to revisit the exact colonies that were found possessing the polygyne allele. Three locations had all three colonies testing positive for the Gp-9b allele and two of those locations (one in Noxubee County and one in Choctaw County) were revisited to determine whether the hybrid ants at those locations were expressing the polygyne phenotype. 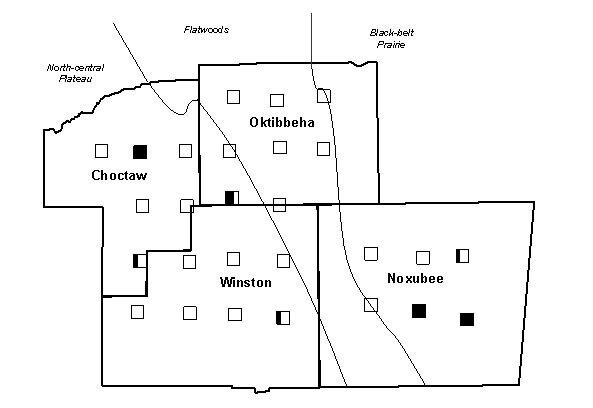 Five colonies were excavated, three from Noxubee County and two from Choctaw County. One colony from Noxubee County was found to have two dealated female reproductives while the other four had only a single queen. The two dealates and two alates from the same colony were tested for the Gp-9b allele and PCR confirmed all four to be positive. The two dealates were divided into separate head and thorax versus abdomen portions and each portion’s DNA was extracted. Polymerase chain reaction was performed for 5 microsatellite regions, Sol 11, 20, 42, 49 and 55 (Krieger and Keller, 1997, with modifications) and differences of microsatellite alleles within each queen’s respective portions indicated insemination of one of the dealates but not the other. Table 1. Alkaloid (IALK), cuticular hydrocarbon (IHC), and combined indices, along with county of origin, for the 14 hybrid colonies possessing the Gp-9b allele. A colony was considered to be hybrid if the combined index was greater than 0.06 and less than 0.85 (Ross et al.1987). Valles and Porter’s (2003) method targets a region within Gp-9 that can be used to distinguish between North American populations of monogyne and polygyne S. invicta, but will not distinguish between monogyne and polygyne forms of most South American populations of that species, or of other closely related species such as S. richteri. This is because their primers target a region of Gp-9 (amino acid position 151) whose altered sequence matches the allele of the North American polygyne populations but not the allele of these other populations (Krieger and Ross 2002, Gotzek et al. 2007). Once we understood our selected method’s limitations, we performed a different test, substituting a newly designed primer pair that targets a region (amino acid position 42) that would allow us to distinguish between the social forms of almost all populations of S. invicta and S. richteri. A multiplex reaction of our new primers and Valles and Porter’s B allele primer pair produces a 370 bp and 517 bp amplicon in the case of a heterozygous colony. This test yielded the same results as our initial test (the same 14 colonies testing positive for the polygyne associated allele). We were unable to secure verifiable control DNA of polygyne native range S. invicta or polygyne S. richteri and subsequently chose to publish our results by using Valles and Porter’s methods because there was already a published account of its accuracy, and our test had been conducted using easily obtained positive polygyne controls of S. invicta from North America. Since preparing this paper, another study (Gotzek et al. 2007) has revealed the presence of significantly more variation in regards to Gp-9 and it is possible that colonies exist whose alleles would not be detectable by even our more inclusive test. Considering this, our findings need to be limited by the acknowledgement that there exists a remote possibility that a greater proportion of our samples came from polygyne colonies than were detected. We can say with confidence, however, that those which were identified as possessing Gp-9b using the Valles and Porter (2003) method are carrying an allele associated with polygyny in North American populations of S. invicta. The presence of the Gp-9b allele in colonies of hybrid imported fire ants confirms that this genetic trait has persisted after hybridization between the red and black imported fire ants. The polygyne allele was found in hybrid imported fire ants at seven out of 27 sites (26%), which is slightly greater than the frequency of polygyny reported for North American populations of S. invicta by Porter et al. (1997). This suggests that its occurrence has not been diluted by hybridization with S. richteri. Because only seven locations with this allele were found, its absence from colonies within the Flatwoods region does not give proof of a regional limitation on its occurrence. There was a cluster of 7 colonies with the polygyne allele at three locations within the Black-belt Prairie region in the southeastern corner of our survey area (Figure 2). Past descriptions of polygyne colonies from the hybrid zone have also come from this region (Glancey et al. 1973, Glancey et al. 1989) and the prevalence of the polygyne form there is worth further investigation. Because the polygyne form tends to spread horizontally by budding, they may spread easily through a more open landscape like that found in the prairie region. It is also possible that because this area is closest to S. invicta’s range, there has been interbreeding between polygyne S. invicta and monogyne hybrid colonies, leading to an increased prevalence of polygyne hybrids in this area. One of five colonies excavated from the two locations that were revisited had two dealate females that tested positive for the Gp-9b allele, but only one of those was found to have been inseminated. The inability to locate more than one inseminated queen means that we were not successful in confirming polygyny behaviorally. Glancey et al. (1989) found colonies that were confirmed to be hybrid (by using similar methods to our own), and expressed the phenotype of polygyne colonies, but they lacked the techniques currently available to confirm the genetic traits associated with polygyny. We have provided the locations where these colonies were found (Table 1) and encourage others, using both molecular methods and behavioral assays, to investigate the expression of the polygyne phenotype by hybrid imported fire ants. The following individuals contributed to this project through their advice or assistance: Dr. John Schneider and Dr. Eric Linder of Mississippi State University, Dr. Ronald D. Weeks of USDA-APHIS, Juliet D. Tang, Doug Stone, Jeremy Norris and David Menough. This project was funded in part by the USDA Fire Ant Project at Mississippi State University, ARS Cooperative Agreement 6402-22320-001-01S and in part through the Mississippi Agricultural and Forestry Experiment Station. Approved for publication as J-11187 of the Mississippi Agricultural and Forestry Experiment Station, Mississippi State University. Figure 1. (a) Results of polymerase chain reaction (PCR) using oligonucleotide primer pairs targeting the Gp-9 locus. The second lane from the right was produced by ants from a colony in Choctaw county with the heterozygous polygyne genotype for the Gp-9 allele, possessing both 517 bp and 423 bp amplicons. Also included are chromatograms of purified cuticular hydrocarbon samples collected from the same colony (b) and typical red (c) and black (d) imported fire ant colonies. Figure 2. The occurrence of colonies with the Gp-9b allele across Choctaw, Oktibbeha, Winston and Noxubee counties in the imported fire ant hybrid zone. Survey locations (‚) are shaded to represent the proportion of colonies sampled at each location possessing the polygyne allele. Buren, W. F. 1972. Revisionary studies on the taxonomy of the imported fire ants. J. Geo. Entomol. Soc. 7: 1-26. Fritz, G. N., R. K. Vander Meer and C. A. Preston. 2006. Selective male mortality in the red imported fire ant, Solenopsis invicta. Genetics 173: 207-213. Glancey, B. M., C. H. Craig, C. E. Stringer and P. M. Bishop. 1973. Multiple fertile queens in colonies of the imported fire ant, Solenopsis invicta. J. Geo. Entomol. Soc. 8: 327-328. Glancey, B. M., R. K. Vander Meer and D. P. Wojcik. 1989. Polygyny in hybrid imported fire ants. Flor. Entomol. 72: 632-636. Gotzek, D., D. D. Shoemaker, and K. G. Ross. 2007. Molecular variation at a candidate gene implicated in the regulation of fire ant social behavior. PLoS ONE 2(11): e1088. Keller, L. and K. G. Ross. 1999. Major gene effects on phenotype and fitness: the relative roles of pgm-3 and gp-9 in introduced populations of the fire ant Solenopsis invicta. J. Evolutionary Bio. 12: 672-680. Kreiger, M. J. B. and L. Keller. Polymorphism at dinucleotide microsatellite loci in fire ant Solenopsis invicta populations. Mol. Ecol. 6: 997-999. Kreiger, M. J. B. and K. G. Ross. 2002. Identification of a major gene regulating complex social behavior. Science. 295: 328-332. Macom, T. E., and S. D. Porter. 1996. Comparison of polygyne and monogyne red imported fire ant (Hymenoptera: Formicidae) population densities. Ann. Entomol. Soc. Am. 89: 535-543. Morel, L., R. K. Vander Meer and C. S. Lofgren. 1990. Comparison of nestmate recognition between monogyne and polygyne populations of Solenopsis invicta (Hymenoptera: Formicidae). Ann. Entomol. Soc. Am. 83: 642-647. Porter, S. D., D. F. Williams, R. S. Patterson and H. G. Fowler. 1997. Intercontinental differences in the abundance of Solenopsis fire ants (Hymenoptera: Formicidae): Escape from natural enemies? Environ. Entomol. 26: 373-384. Ross, K. G., R. K. Vander Meer, D. J. C. Fletcher, and E .L. Vargo. 1987. Biochemical phenotypic and genetic studies of two introduced fire ants and their hybrid (Hymenoptera: Formicidae). Evolution, 41: 280-293. Ross, K. G. 1997. Multilocus evolution in fire ants: effects of selection, gene flow and recombination. Genetics, 145: 961-974. Streett, D. A., T. B. Freeland Jr. and R. K. Vander Meer. 2006. Survey of imported fire ant (Hymenoptera: Formicidae) populations in Mississippi. Flor. Entomol. 89: 91-92. Valles, S. M. and S. D. Porter. 2003. Identification of polygyne and monogyne fire ant colonies (Solenopsis invicta) by multiplex PCR of Gp-9 alleles. Insect. Soc. 50: 199-200. Vander Meer, R. K., C. S. Lofgren and F. M. Alvarez. 1985. Biochemical evidence for hybridization in fire ants. Flor. Entomol. 68: 501-506. Vargo, E. L. and S. D. Porter. 1989. Colony reproduction by budding in the polygyne form of Solenopsis invicta (Hymenoptera: Formicidae). Ann. Entomol. Soc. Am. 82: 307-313. Wilson, E. O. 1951. Variation and adaptation in the imported fire ant. Evolution, 5: 68-79. Wilson, E. O. 1959. Invader of the South. Nat. Hist. 68: 276-281.